Cameroon is facing a growing danger of economic collapse and a civil war, provoked in large part by French government support for the 85 year President Paul Biya. 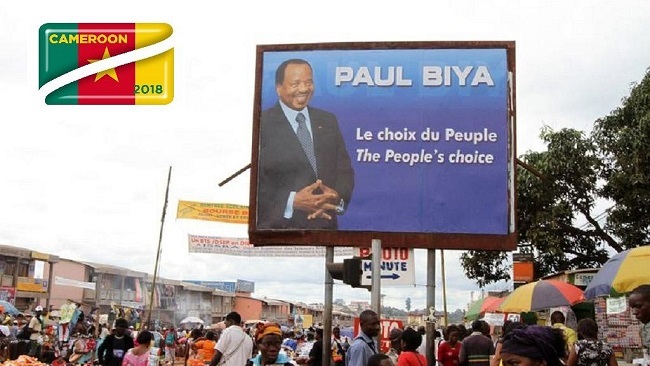 This week Biya tweeted his intention to run for the October presidential elections amid worsening security situation in the country. The Biya move came after the United States ambassador Peter Barlerin sounded a note of caution to the CPDM Chairman to step aside. The Biya action has failed to win wide support in the entire nation. In announcing his decision, Biya is responding to intensifying pressure from the Western powers particularly the US. The US Senate recently held a hearing on the crisis in Southern Cameroons which will eventually commit Washington to use its influence to block all international aid and financial assistance for Cameroon. This comes on top of sanctions already implemented by the Federal Republic of Germany. The UK, meanwhile, has decided to maintain a kind of deliberate silence on the crisis in Ambazonia but has however up the African activities of its foreign intelligence service MI6 in the Gulf of Guinea. Britain had long established a new ministerial committee, ostensibly to give advanced warning of coup attempts and threats of civil war in sub-Saharan Africa. The ruling CPDM crime syndicate which is mainly based in the cities of Douala, Yaounde and Maroua including some towns and villages in the Center and South regions has alienated not only Southern Cameroonians but also the Bamilekes, the Bassas and the Sawas. The widening political division between Southern Cameroons and the Biya Francophone Beti Ewondo regime and the long standing grievance of the Ahmadou Ahidjo following contains the potential for civil war. The sharp decline in living standards, 95 percent unemployment and the increasingly repressive character of Biya’s rule provoked popular opposition deep within Southern Cameroons and created conditions for violent social conflict. Aware of the extent of social and political tensions, Biya declared war against his own people-the people of the Federal Republic of Ambazonia. The 85 year old dictator has never accepted measures that would undermine his rule and as I write, his kinsmen and women in the army are moving like a train with no brakes crushing anyone on Biya’s way. The US through the voice of its ambassador Peter Barlerin has decided that it was time to move against Biya. But the world’s strongest nation is yet to cut off funds and investment to Yaoundé and have failed to encourage the formation of an alternative political leadership that is more responsive to US and EU demands. Biya offers no progressive response to Western demands and meddling. Instead, he is seeking to hold onto power by whipping up anger of the Francophones not only against Southern Cameroonians but also against the Bamilekes. For nearly four decades, Biya did little to make Ambazonians feel Cameroonian, resulting in an erosion of popular support in Southern Cameroons for his regime. In an attempt to reverse Biya’s decline and counter calls for an Anglophone head of state, Biya declared war on Southern Cameroons. For the last two years, the Francophone dominated army has been patrolling Southern Cameroons towns and villages, killing innocent civilians and beating up people suspected of supporting the quest for an independent state.